It’s 5 a.m. and I’m sitting at a computer, bare footed with a glass of freshly squeezed orange juice at my elbow. Mr A and I have annoyingly been up for quite a while, surfing futiley through a gazillion TV channels, knowing that come 3 p.m. all we – and Miss R- will want to do is flop under a ceiling fan and have a wee siesta. But we will be too busy alligator spotting at the local nature preserve or burning up the plastic in a meat locker-cold mall for such simple pleasures. Yup, we are not at home in Edinburgh, but in fact visiting my family in Florida. And, despite the decided lack of zzzs, it is worth all of the crummy jet lag in the world. For some reason getting off the plane from Edinburgh to Tampa is almost always a shock. The warmth and humidity hit you like a duvet-covered wall, the oxygen seemingly sucked out and replaced with invisible water. Despite having lived in Florida for half of my life, still it sneaks up on me, much like the inexplicable surprise of shortened days and drawn out nights do back home in the UK. Predictable yet unexpected. After a few slightly panicked gulps of the saturated air we are fine – sweaty, but fine. And now I am fully acclimatised, save for the sleep thing. If it dares dip below 70 (Heaven forfend) I have a cardigan on stand by, but today looks set to be a continuation of many a Scottish person’s dream – high of 86 F and no rain in the foreseeable. My Dad hates to see me work too much in the kitchen so often we eat out or graze, mainly healthy choices (e.g. Chilpotle’s, Bonefish Grill) but a few less so (e.g. Cappy’s, which has the best marinara sauce I’ve tasted in quite awhile, but smothering a gorgeous fresh pizza). I doubt a Cinabon, Bloomin’ Onion or Slurpee will pass our lips. Instead we will be doing a wholly unscientific sample of as many fresh-ingredient restaurants that our greed and stomach capacity will allow. Southwest Florida excels in family-run restaurants, as well as seafood and most any vegetables – save root crops – so I am looking forward to some superb meals. I will pass on any good finds in a later post. But one of the best dishes we are likely to eat has already been eaten – my Dad’s beefstew. No recipe from him (he doesn’t do measurements), but it was mighty welcome after spending nearly 24 hours on the go. Nothing says welcome home like a bowl of lovingly made stew – even if it is 80 degrees and midnight. In amongst the eaten out meals and the likes of my Dad’s awesome chilli and his vegetable pot pie, this recipe will feature at some point during our visit. I want it with a generous dollop of extra lemony hummus and a plate of thinly sliced oranges and red onions. Mr A and my Dad will doubtless want it with a side of meaty protein (typical men), so a few sumac-rubbed lamb chops might be consumed as well. Luckily this recipe is nice warm, room temp or cold. Makes fab leftovers and lunchbox fodder too. Nutrition chat will return when I get back home (and out from under another jetlag-induced fug). But trust me, as always, this is nutritious and hopefully delicious. Oh, and I’m still wanting your favourite autumn healthy comfort foods – links to your own or someone else’s recipes or even a mention of a favourite dish or ingredient. Please send them to me at ksfanderson@gmail.com or just pop it into thye comment box. I hope to write a special post featuring readers’ faves in the next couple of weeks. Your recipe or mention will be very welcome. Thank you. This – I hope – is a hugely versatile salad template. I do this recipe ‘pattern’ all of the time, varying it according to what I have and what I fancy having. 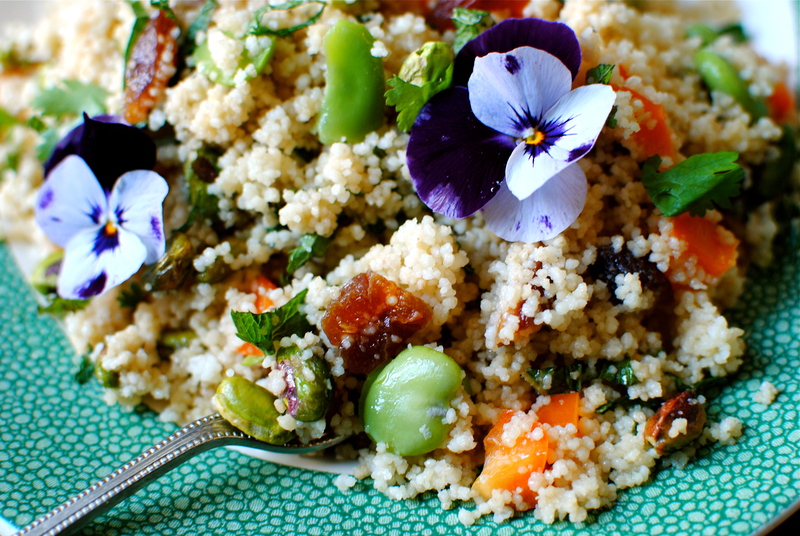 Instead of couscous, you could use nutritionally superior quinoa; for the edamame, sub in broad beans or fresh peas; and completely freestyle with the dried fruit, vegetables (steamed sweet potato?) and herbs. I hope you try this as is, but the basic grain, dried fruit, vegetable, herb, fruit and honeyed-lemon dressing matrix offers many possibilities. The only ‘rule’ is balance – with the textures, amounts (you don’t want it too grainy) and flavours. Another thing I often do – because I am a bit hung up on texture – is add in a small amount of a larger couscous, such as mograbieh or Israeli couscous. You actually have to cook this couscous as opposed to soak it, so pop some in a pan and cook it like pasta for about 8-10 minutes. Whole grain versions of both the smaller couscous and the larger, tapioca-sized couscous are available in well-stocked supermarkets and in health food stores – and of course online. Wholegrain versions have a few more calories but a lot more nutrients. I think a mixture of wholegrain and refined is a nice balance of texture, flavor and nutrients. 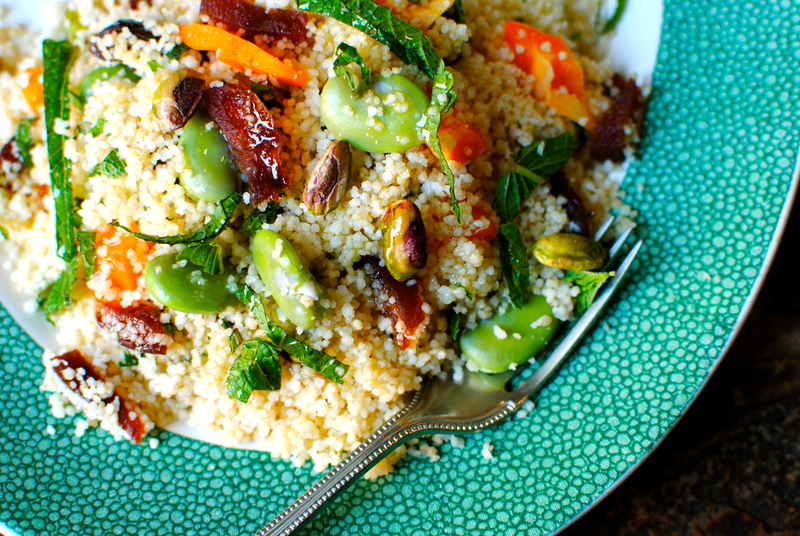 I will share other couscous and grain dishes in the near future. First of all make the couscous: pour the dried couscous in a large, shallow bowl and cover it with enough boiling water to come just above the couscous – about ¼ inch. Cover immediately with cling film or a large plate. Set aside for five minutes. If it’s not fully absorbed, leave a few minutes before fluffing with a fork to separate and dry the grains. If you are using quinoa, rinse the grains and pour them, and double their volume in water, into a saucepan, and bring to the boil before turning to simmer for eight minutes. Turn off the heat and let steam cook for a further five minutes. Fluff the grains as for couscous. Make the dressing by putting the lemon juice, honey, oil and seasoning into a lidded jar and shaking like crazy. Now chop most of the herbs into thin strips, leaving some a bit more roughly chopped. 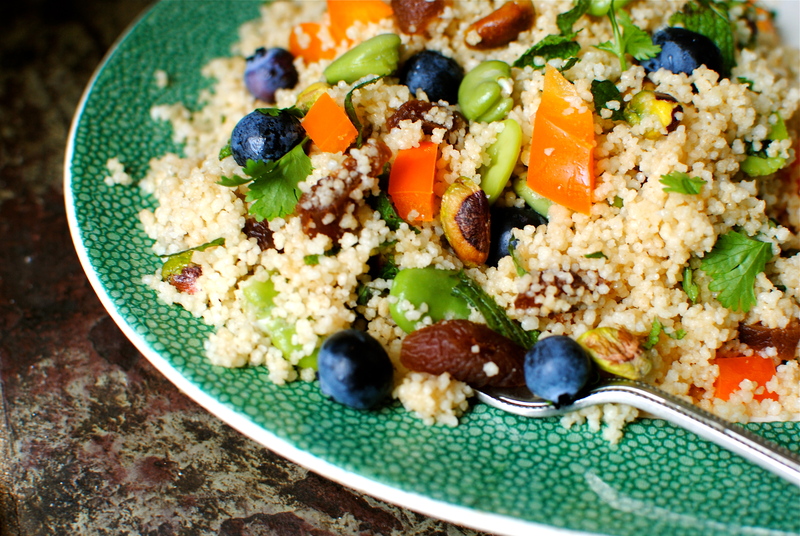 Finally toss everything together – the blueberries, apricots, pistachios, zest, herbs, edamame/broad beans and dressing. Serve immediately with a green salad for a light lunch, or as a side dish for griddled chicken, poached fish or as part of a meze with hummus, toasted pitta bread and griddled vegetables. Sounds delicious! Love the idea of adding blueberries and mixing in some Israeli couscous. Glad you like the sound of it. The colours and textures from the blueberries and Israeil couscous are quite appealing, I think. Thanks for commenting! You are allowed to have a holiday from your blog you know! Writing it from a visit to Florida is definitely above and beyond the call of duty. But this sounds great, and I can’t wait to try it. Thank you Shirley. I brought some photos on a USB just in case I had time, so because I am up early I thought I would write a short little, research-free post. So don’t feel sorry for me 😀 I hope you like the salad. What a BEAUTIFUL salad Kelly and I love the addition of the little pansies, I love cooking with flowers…….enjoy your time in Florida with your family and I am impressed that you have made a blog post! A truly rainbow coloured meal – looking forward to trying it. Happy hols!! Thanks Catherine. Great to hear from you, and I’m looking forward to an almighty catch up next month at the conference. I do hope you make the salad – pansies optional! What a beautiful salad! Bookmarked – thank you. Why thank you Angela. I must admit it is a very attractive looking salad. I hope you think it tastes as good as it looks. I might add roasted sweet potato next time, making it a bit more seasonal. This salad is fresh and bright and just gorgeous! Definitely the perfect lunch any day. Hope you’re having a wonderful time in Florida! Thank you Faith! We are still here, enjoying amazing weather (going through the sunscreen in an unseemly fashion). I am being super lazy on the cooking front – too many fantastic restaurants… But I am looking forward to getting back in the kitchen upon my return. I have just looked though my emails and have seen a few recipes from your blog that will definitely get my undivided attention very soon! Gorgeous salad-Love all the colors! Hope your having ( or did have) a wonderful trip visiting your family! Thank you Elaine. Still on holiday and having a wonderful time visiting with family. Not much cooking being done so I looking forward to hitting the kitchen when we return. Too hot to cook! I’ve just looked at my emails and saw your recents posts in my inbox. Cant’ wait to have a proper read of them soon! I made this the other evening to have with a moroccan chicken dish, it was delicious even though I forgot to add the red peppers ! This weekend I will be trying the butternut squash & spinach lasagne and this evening the curry with lemongrass & squash. Off to shop for ingredients now.